Someone told me last week that National Cheeseburger Day was on the way. As far as I’m concerned, every single day could be National Cheeseburger Day, because they’re yummy. Tomorrow is the official day, and foursquare has teamed up with KRAFT to generate some charitable giving based on your potential eating habits. Foursquare’s great for exploring the world around you, but it’s also great for giving back! 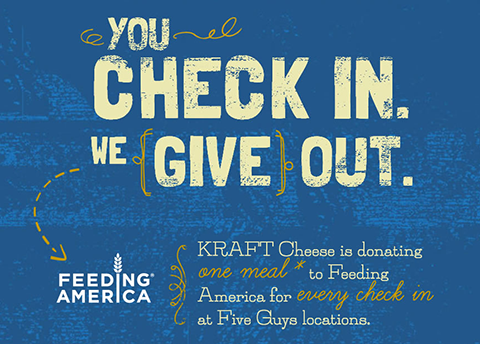 In honor of tomorrow’s National Cheeseburger Day, when you check in at Five Guys Burgers & Fries, KRAFT Cheese will donate the equivalent of a meal to Feeding America, an organization that operates food banks across the United States. The event starts today and lasts for two weeks, so the more burgers, the better! To make sure your check-in counts, go to kraftcheese.com/checkin and connect your foursquare account. Visit the Five Guys foursquare page to find the nearest location, and be sure to swing by soon to nom a cheeseburger and support a good cause. Sure, you could skip the burger and check-in and just give to a great cause, but I’ve found that weaving charitable giving and causes into an event you’ll be participating in anyway is a great way to get people involved. If you go to Five Guys tomorrow to celebrate the day, then just be sure to check-in so that your donation is made. As hokey as it might sound, it could actually make a difference for some folks who are less fortunate.